The Philadelphia Orchestra begins its ninth residency at Bravo! Vail today. The orchestra will perform works of Beethoven, Rachmaninoff and Dvorak as well as some pops this weekend at the Gerald R. Ford Amphitheater. In its first week, Bravo! 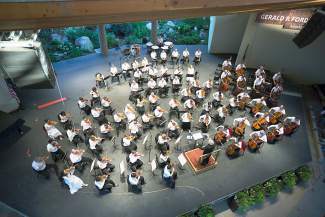 Vail has put on five concerts at the Gerald R. Ford Amphitheater; three free concerts at the Vail Interfaith Chapel, a chamber concert and taped a radio show for National Public Radio. Well, a whole lot more. After a week with the Dallas Symphony Orchestra, The Philadelphia Orchestra begins its residency with a slew of concerts. Gerald R. Ford Amphitheater, 6 p.m.
It’s an evening of Beethoven’s Sixth Symphony and the Rachmaninoff’s Third Piano Concerto as The Philadelphia Orchestra starts its ninth season at Bravo. The Sixth, or “Pastoral,” is somewhat of a rarity for Beethoven as it is a tone poem, depicting scenes in nature, an entirely appropriate selection for this festival. Hopefully, life will not imitate art during the fourth movement. The Philadelphia Orchestra’s history is inextricably linked with Rachmaninoff. Philadelphia’s legendary conductor Leopold Stokowski ushered in the Russian’s works to American audiences and The Philadelphia Orchestra gave the U.S. debut of Rachmaninoff’s Third Piano Concerto among other works. Garrick Ohlsson is no stranger to Bravo! Vail. He last appeared in 2013 when he performed Chopin’s Second Piano Concerto. Ohlsson playing Chopin shouldn’t be surprising as he won the 1970 International Frederic Chopin Piano Competition at the ripe age of 22, the first American to do so. Ohlsson, however, has a broad range in the classical repertoire. His recordings of the Beethoven Sonatas were particularly noteworthy — he won a Grammy for one in 2008. Rachmaninoff’s Third should be a magnificent display of Ohlsson’s talents. Also … Bravo! Vail After Dark: Not enough piano? Bravo’s late-night series starts at the Vail Ale House with Christopher O’Riley at 8:30 p.m.
First off, please note that this is an 8 p.m. start, and that’s because The Philadelphia Orchestra will be playing along with the movies of Pixar, including such favorites from franchises like Toy Story, Monsters Inc. and Cars. This is always a highlight of the season for kids of all ages. Before Dvorak’s iconic work, The Philadelphia Orchestra starts off with Bernstein’s Overture to Candide. Jennifer Higdon’s work returns to Bravo! Vail as Benjamin Beilmann performs her Violin Concerto, for which she won the 2010 Pulitzer Prize for music. Before that, local concert-goers might remember that Higdon was a Bravo! Vail composer in residence. Not only is “New World” a classic, but also it’s always a good selection for Bravo! Vail’s setting. Though the composer was European, this remains, as its title indicates, a very American symphony. Dvorak’s tenure as the director of the National Conservatory of Music in New York from 1892-1895 and his travels throughout the country heavily influence this work. African-American and Native American melodies are interspersed throughout the work. The chamber series continues with one of Mozart’s most-recognizable pieces. Also on the program is Bach’s Concerto for Two Violins in D minor and Grieg’s From Holberg’s Time. The Philadelphia Orchestra’s concertmaster, David Kim, headlines this event. He was magnificent in last year’s chamber performance of Vivaldi’s Four Seasons. Also … There’s a free concert at the Vail Interfaith Chapel, featuring the Dover Spring Quartet at 1 p.m.
• For two of the Dallas Symphony Orchestra’s concerts, there were not encores and that was the correct call. After all, what does one play after the final movement of Beethoven’s Seventh or Mozart’s Requiem? After the DSO performed Berlioz’s Symphony Fantastique, it did play Wagner’s Ride of the Valkyries. There are three reactions from this piece. The first is the infernal Bugs Bunny/Elmer Fudd cartoon, “Kill the Rabbit.” No. 2 is Robert Duvall’s memorable line, “I love the smell of napalm in the morning,” from “Apocalypse Now.” And then there’s the more cynical impulse to want to invade Poland. • Tuesday night’s chamber concert shed a new light on Philip Glass’ Four Movements for Two Pianos. One tends to think of Glass and beating a rhythm to death. The work certainly had Glass’s hallmark rhythmic motifs, but also was an eye-opener to the composer’s melodic skills.